People are now constantly connected and using mobile devices to communicate, shop and stay entertained. In fact, 25% of global pageviews occur on smartphones and tablets.1 Further, there are now more consumers using the web in HTML5-compatible environments than in Flash-compatible environments.2 In order to reach as large an audience as possible, advertisers should build their rich media ads in HTML5. AdWords already supports HTML5 ad units that are made using the built-in templates in AdWords Ad Gallery. AdWords can convert uploaded Flash files into identical HTML5 ads, which can run in places where Flash isn’t supported. Google Web Designer is a free, professional-grade HTML5 authoring tool that lets you build interactive and animated HTML5 ad units, no coding necessary! Create interactive ad units in Google Web Designer, publish them locally as an .html file, and then upload that file as a new image creative in your display campaign. This way, you can run custom, engaging ad units across smartphones, tablets and desktops, engaging consumers in more places with clever and interactive ad experiences. Want to learn more? Visit our website and download Google Web Designer for free. Then, learn how to create engaging, rich media ads in our Help Center. *Note: Adwords only supports .html file uploads from Google Web Designer. No other HTML5 authoring tools are supported at this time. We recently added the ability for AdWords advertisers to upload HTML5 ads built with Google Web Designer into Google Display Network campaigns. Below is an overview of how you can use this integration to build HTML5 ads for your GDN campaigns.
. The popular global accommodations company creates models to understand the value that every new customer brings over his or her lifetime. Then, equipped with flexible budgets, their digital marketing team is able to reach all the right customers at the right time. Check out the full story here. Being a profit-driven marketer means challenging traditional methods in order to reach new levels of success (and profits). We’ve launched a practical guide, where you’ll learn how to strategically bid up CPAs and flex ROI limits to grow your digital campaigns, just as Airbnb and others have done. Find the full guide on Think with Google. A new breed of marketers have made the shift to “profit-driven marketing,” which is about tackling traditional marketing challenges with unconventional approaches. For example, they understand that in order to make more money, they have to strategically invest more money first. One company employing this new strategy is Airbnb. The popular global accommodations company creates models to understand the value that every new customer brings over his or her lifetime. Then, equipped with flexible budgets, their digital marketing team is able to reach all the right customers at the right time. Check out the full story here. Are your Product Listing Ads ready for August 31st? for advertisers to upgrade to Shopping campaigns quickly and easily. If you’ve already upgraded, then you’re all set. If you haven’t upgraded yet and don’t do it by the end of this month, the following is what will happen to your regular Product Listing Ads (PLA) campaigns come September. Phase 1: Limited functionality of all regular PLA campaigns - Starting September 2nd, you will not be able to edit your product targeting, max. CPC bids, promotional text and destination URLs anymore. Campaign statuses and budgets will remain editable so you can manage your spend until your regular PLA campaigns are auto-upgraded to Shopping campaigns. Phase 2: Auto-upgrade to Shopping campaigns - Throughout September, regular PLA campaigns that received impressions in the preceding few weeks will be auto-upgraded to a new Shopping campaign with a similar campaign structure. Some regular PLA campaigns, settings and bids might not carry over to your new Shopping campaign due to technical limitations. Once your regular PLA campaigns are auto-upgraded, you’ll receive an email notification and your regular PLA campaigns will stop serving PLAs. Further details on the auto-upgrade are in the AdWords Help Center. As a final reminder, upgrade your campaigns before September to ensure they are set up as you’d like. We recommend using the upgrade tool as it walks you through the upgrade process step by step. For more information, visit this help center article on the retirement of regular PLA campaigns and the automatic upgrade to Shopping campaigns. If you have any questions, reach out to the AdWords Community Forum or contact us. 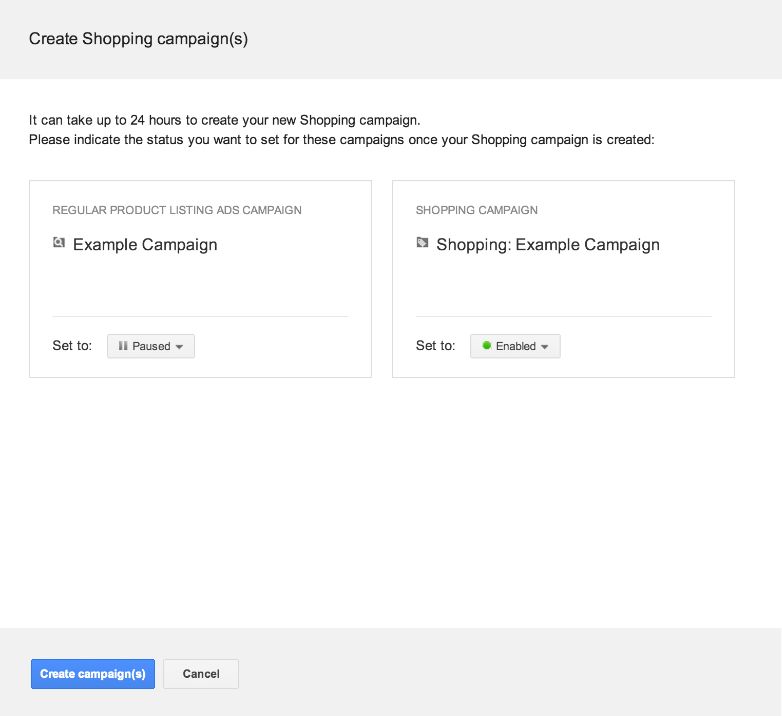 Earlier this month, we introduced an upgrade tool for advertisers to upgrade to Shopping campaigns quickly and easily. If you’ve already upgraded, then you’re all set. If you haven’t upgraded yet and don’t do it by the end of this month, the following is what will happen to your regular Product Listing Ads (PLA) campaigns come September. our next generation of app promotion ads across Google Search, the Google Display Network and YouTube. The features on the Display Network launched in June as part of Google I/O. Today, I’m excited to announce the global availability of the search ads and YouTube offerings. There are over 100 billion searches per month on Google.com. People search here for places to visit, movies to watch or music to listen to. Sometimes this content lives on a website, sometimes it’s in an app. Now with just 3 easy steps, you can get your app into an ad by using a new, simplified campaign set-up flow that promotes your app on Google.com. Search ads created with this new flow are only shown to people who don’t already have your app -- so every click is from a potential new user, saving you time and money. How do you select the best keywords so your ad shows to consumers most likely to download your app? Use the keyword suggestion tool for app ads on search. This tool suggests keywords to include in your campaign based on top queries used for finding your app on Google Play and Google Search. FarFaria, a leading children’s e-book app, expanded their Google search ads keyword lists by using this tool and was able to unlock 30% more app downloads while maintaining a click through rate of 3% and a cost per install that was 50% below other mobile networks. Once you have a large base of users who’ve installed your app, how do you keep them engaged? Starting today, you can deep link users directly from Google Search into specific pages of apps they’ve already installed by signing up for the beta here. Customers like LINE, Zoopla and Booking.com are already testing deep-linking with their apps. Here’s how it works: let’s say someone has the Booking.com app installed on their phone and searches for “San Francisco Hotels” on Google.com; now they can go directly to the specific page in the Booking.com app that shows listings for hotels in San Francisco. The power of sight, sound and motion makes YouTube users more than 2X more likely to download apps.1 Starting today, you can showcase your app when people are watching their favorite videos using a new enhancement to TrueView ads. With TrueView, advertisers can reach potential customers based on their interests, previously-watched videos and demographics. Deepak Gupta, chief revenue officer at MachineZone, a leading mobile game developer, noted that by "Using YouTube we didn't just find more customers, we found more of the ‘right’ customers. We know video platforms in general deliver valuable users, but we found that users who download our app from YouTube are 15% more valuable than those from any other video platform." Over the coming weeks we’ll dive into these new features with tips and best practices on the Inside AdWords blog and on our Google+ page. We also invite you to register for our “Promoting Your App on Search” Google Hangout On Air on 9/18. Earlier this year, we announced our next generation of app promotion ads across Google Search, the Google Display Network and YouTube. The features on the Display Network launched in June as part of Google I/O. Today, I’m excited to announce the global availability of the search ads and YouTube offerings. have called a business directly from search ads. AdWords click-to-call ads, call metrics, and calls as conversions help you connect with these customers and gain insight about those calls. However, many customers also call your business after clicking through a Google ad and learning more about the products and services you offer on your website. That’s why today we’re launching website call conversions, a powerful way for you to identify and measure calls from your website that occur after an ad click. Let’s say your Google search ads send people to your website where they research and learn more about your business. Website call conversions dynamically inserts a Google forwarding number on your website that measures the calls made by these customers. Whether they click on the number or dial it directly from their phone, you can attribute the call conversion and conversion value back to the keyword and ad that drove the customer. You can learn more about setting up website call conversions here. With website call conversions, you can understand which keywords and ads are driving the most phone calls from your website and which are resulting in more valuable calls. You can also assign different values to calls originating from different pages of your website. For example, a local car dealership might assign more value to calls from their test drive page and less value to calls from their homepage. You can also automatically optimize your keyword bids to drive more calls or more valuable calls by using Target CPA or Target ROAS respectively. These flexible bid strategies factor in signals like device, location, and time of day to make auction-time bid adjustments that maximize website call conversions and conversion value respectively, while reaching your business goals. To start measuring these website calls, place the snippet of code on your desktop or mobile website and a unique Google forwarding number will be generated for each AdWords ad click. These numbers will continue to display for up to 90 days to capture future call conversions. 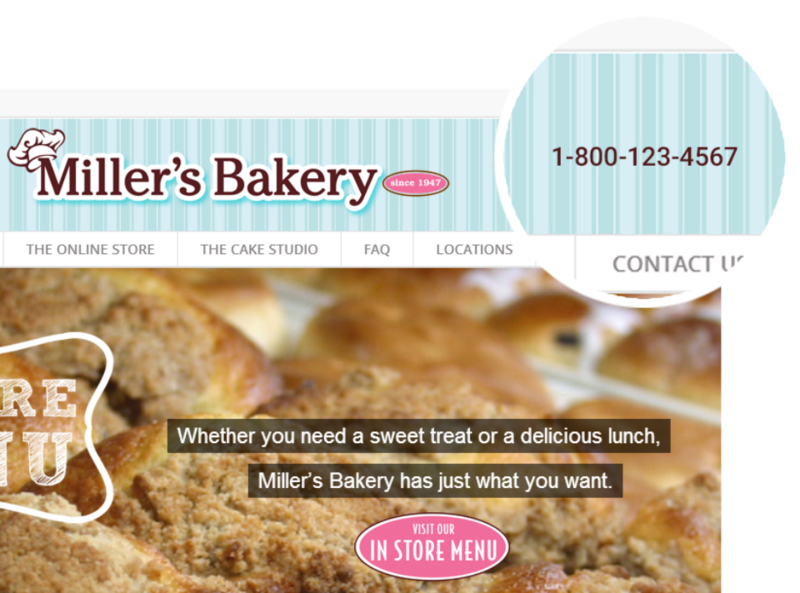 To ensure this experience is seamless, you can customize the look and feel of these numbers to match your website, including: color, font, and size. Website call conversions is available in countries where Google forwarding numbers are available*. They work with AdWords click-to-call ads and can be used alongside other call tracking solutions. Reporting on website call conversions is available in Call Details and through standard conversion reporting. You can learn more about website call conversions and how to set it up, here. Want to get more out of AdWords? Sign up to receive our monthly Google Best Practices newsletter. 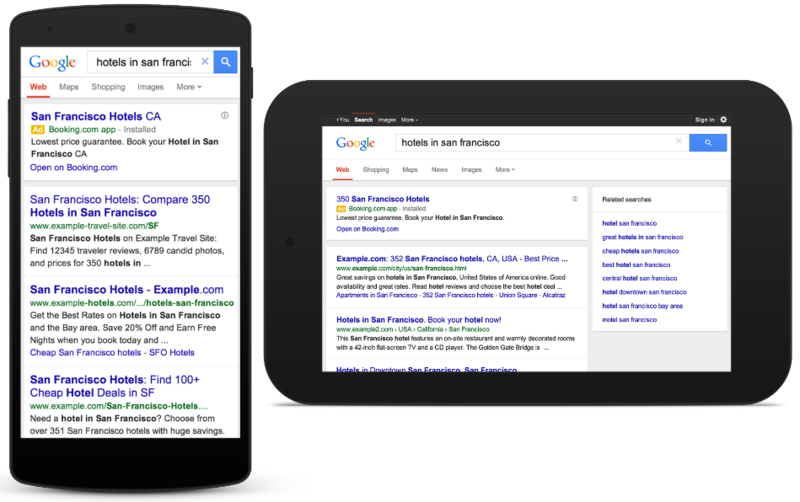 Seventy percent of all mobile searchers have called a business directly from search ads. AdWords click-to-call ads, call metrics, and calls as conversions help you connect with these customers and gain insight about those calls. However, many customers also call your business after clicking through a Google ad and learning more about the products and services you offer on your website. That’s why today we’re launching website call conversions, a powerful way for you to identify and measure calls from your website that occur after an ad click. , an intuitive way to connect people with the businesses they’re searching for, to all exact and phrase match keywords. Since it was introduced in 2012, advertisers have seen strong results. In fact, a vast majority of you are already matching to close keyword variations, receiving an average of 7% more exact and phrase match clicks with comparable clickthrough and conversion rates. In addition to increased keyword coverage, these incremental clicks represent valuable opportunities that are missed by "Low search volume" keywords, common for misspellings and abbreviations. Shopify - "We’re passionate about achieving high efficiency, high impact, and high relevance with our customers. Having our keywords match to close variations allows us to do exactly that. Additional matches like "online shopping" to the keyword "online shop" resulted in a 100% increase in relevant clicks across exact and phrase match keywords--with cost per click remaining steady. What's more, we've gained valuable time savings since manually adding misspelled keywords to our campaigns is now unnecessary." Starting in late September, we’re applying close variant keyword matching to all exact and phrase match keywords. Because close variant matching was already the default setting for campaigns, most of you won’t see a change in your keyword matching behavior. For advertisers that opted out, the option to disable close variants will be removed in September. Your exact and phrase match keywords will then begin matching to close keyword variations, allowing you to reach more of your potential customers with the right ad while aiming to lower cost per click and improve clickthrough rate. With this update, you no longer have to build exhaustive lists of misspelled, abbreviated, and other close variations of your keywords to get the coverage you want. Instead, focus on adding negative keywords--including close variants you don’t want to match for--to shape traffic and reduce cost. This can improve your campaigns’ ROI and help deliver a better ad experience for your customers. You can learn more about the benefits of negative keywords in our new keyword white paper. Keep in mind that the AdWords system prefers to trigger ads using keywords that are identical to search queries, so you can still use misspelled, abbreviated, and other close variations of your keywords. If you find that performance varies significantly between close variants, you can add the better performing ones as separate keywords and adjust their bids accordingly. To learn more about keyword matching options, please see our Help Center article. People aren’t perfect spellers or typists. In fact, at least 7% of Google searches contain a misspelling. And the longer the query, the greater the likelihood of a typo. But even if what they’ve typed isn’t perfect, people still want to connect with the businesses, products, and services they’re trying to find. Whether it’s “kid scooters”, “kid’s scooter”, or “kids scooters”, people interested in buying a scooter for their child want to see the most relevant ads despite slight variations in their search query. That’s why starting in late September, we’re applying close variant keyword matching, an intuitive way to connect people with the businesses they’re searching for, to all exact and phrase match keywords. If you haven’t started your upgrade, we encourage you to use this tool as a jumping off point for your Shopping campaigns. Be sure to check your campaign budgets, settings and bids so they’re customized to your business needs. Note that not all campaigns are compatible with this upgrade tool. If, for example, you use AdWords labels or groupings in your product targeting or inventory filters, you must update your data feed with custom labels before you use the upgrade tool, unless you’re happy to use another attribute to subdivide your inventory in AdWords directly. You can access the upgrade tool, and check which of your campaigns are eligible, in the Settings tab of your existing Product Listing Ads campaigns. Learn more in the help center. We want to make sure you’ve thoughtfully upgraded and are ready for the holidays. Join us for a Learn With Google Hangout on Air on August 12 at 10:00am PST to walk through the new upgrade tool. If you have any questions, reach out to the AdWords Community Forum or contact us. This is the final stretch. At the end of August, regular Product Listing Ad (PLA) campaigns will retire and be replaced by Shopping campaigns. A majority of you have started upgrading to Shopping campaigns, but if you’re one of the few who haven’t yet, we’re introducing a new upgrade tool that’ll help you upgrade in a matter of clicks. This tool creates a Shopping campaign from your regular PLA campaign, with a campaign structure and bids based on your regular PLA campaign and historical performance data. we shared some of the ways that advertisers like WordStream and Elmo Talent Software have been getting great results with the new AdWords Search Network with Display Select campaign type. Since then, hundreds of thousands campaigns have already upgraded to this new campaign type. As a reminder, starting on September 16th, 2014 all “Search and Display Networks” campaigns will be upgraded automatically to the new, better performing “Search Network with Display Select”. We encourage advertisers to upgrade before September 16th so your campaigns are set up as you'd like. Campaigns that haven't been upgraded will be automatically changed over. “Search Network only” and “Display Network only” campaigns will not be impacted. If you’re running a “Search and Display Networks” campaign you can upgrade now with just a single click and get better results right away. Better performance: Advertisers who’ve upgraded to “Search Network with Display Select” have, on average, seen a 35% higher click-through rate and a 35% lower cost-per-customer purchase for ads shown on the display portion of their “Search Network with Display Select”. * Results will vary based on your campaign. Easier to manage: Manage it just like a regular search campaign. Your settings like keywords and bids will automatically be used to find customers on the Display Network, which means there's no extra work required! Ability to customize based on how you wish your campaigns to perform: When you upgrade, you may get fewer clicks and impressions, but they’re more likely to be from people who are ready to make a purchase from your business. If keeping your current click levels is important for your advertising goals, also create a new “Display Network only” campaign. This allows you to incorporate the settings and targeting options from your original campaign to help you maintain your click levels. We want you to succeed with AdWords. Please contact us if you’d like any help upgrading to “Search Network with Display Select”. For more details, tips and resources on succeeding with AdWords, please visit our help center. *Based on initial test results, the average customer could see a 35% higher click-thru-rate and 35% lower CPA on the display portion of their new “Search Networks with Display Select “campaigns compared to existing Search & Display Networks campaigns. Based on initial test results, the average customer could also see 10-15% incremental conversions compared with “Search Network only” campaigns. Individual campaign performance may vary. Earlier this year we shared some of the ways that advertisers like WordStream and Elmo Talent Software have been getting great results with the new AdWords Search Network with Display Select campaign type. Since then, hundreds of thousands campaigns have already upgraded to this new campaign type. Imagine a shopper has searched for a product on Google Shopping and found the perfect offer at the perfect total price inclusive of shipping. They reach checkout on the merchant’s site only to realize that the final price differs from what they’ve seen on Google due to inaccurate shipping costs. Our users consistently tell us this is a primary source of frustration. To help you display more accurate total prices to shoppers, we've made the configuration of shipping rates in Merchant Center more powerful and easier to use with a new shipping configuration tool. Shipping rules: Select from an expanded list of shipping methods, including customizable methods based on a hierarchical set of rules. Multiple shipping methods: Differentiate between various shipping methods, such as ground versus express, for the same country, so Google can display the lowest possible price to the user. Customization based on location: Configure rates based on shipping destination using countries, states, or cities. Simplified exclusion options: Indicate when products do not ship to certain regions. Reusable shared library: Create a repository of shipping methods you can reuse across various custom configurations. In addition to the new tool in Merchant Center, we have also added a new shipping attribute to assign a shipping label to specific products. You can configure shipping rates based on this label. For example, you could apply a label like “perishable” or “bulky” to a group of products requiring special shipping rates or a label specific for promotional items. After adding this attribute to a group of items, you may manage or configure the custom rate in shipping settings in Merchant Center. We’ve migrated your current shipping settings to this new tool. They do not require any update. 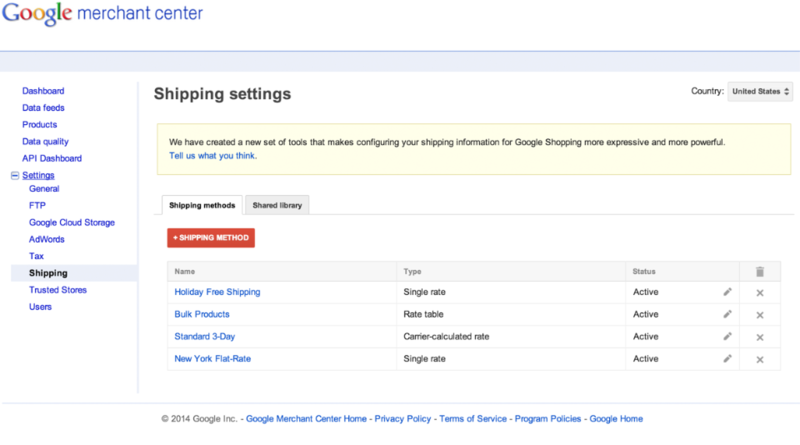 We encourage you to check out the new features to review whether they can help you simplify or improve your shipping rate configuration on Google Shopping. Both current and newly created shipping methods will be subject to review with our existing shipping policy. Join us for a Hangout on Air on September 16th as we walk through the tool and cover best practices for setting up shipping rates in Merchant Center. Sign up for the event. Posted by Angelika Rohrer and Sven Herschel, Google Shopping Team.